OK, if you’re a true carnivore, the idea of a meatless “burger” is probably unorthodox at the least, heresy at worst. An affront to everything a burger stands for. Like Jimmy Buffett croons, “Not zucchini, fettuccine or bulgur wheat, but a big, warm bun and a huge hunk of MEAT!” So why then am I making Veggie Burgers? In a word — my daughter, Emily. She requested it. You see, many of her roommates and friends fall into the vegan, vegetarian, pescatarian spectrum of eating. She wanted to cut back on meat and try some new ways of eating. I listened, harrumphed and stuck her request in my back pocket… So, here we are — months later — and nothing… So…. I’d never actually made a veggie burger before, unless you count those Portobello burgers from a few years ago. I researched a few different methods — some calling for grains like quinoa or farro, others focusing on lentils and beans. I ended up going with a combo of vegetables, grains and beans. Does that sound weird? It wasn’t. It was delicious. I’ll admit when I was mixing it all together I was dubious, the mixture sure didn’t look like any burger I’d ever seen before. It was loaded with healthy vegetables, grains and legumes. Flavored with onions, garlic smoked paprika, cumin and chipotle powder. But what would it taste like? I made up the patties, chilled them a bit so that they’d hold their shape better while frying and dipped them in cornmeal to create a crunchy crust against the soft interior of the burger. I used a cast-iron skillet and a bit of coconut oil to fry them — but olive oil would work well too. The key to any good burger is how you build it — and I went all out with lettuce and tomato, sliced red onion and mashed avocado. This is a two-handed affair. It’s so loaded with ingredients, one hand just won’t cut it. Emily gave this a hearty nod of approval — she couldn’t speak because her mouth was full. 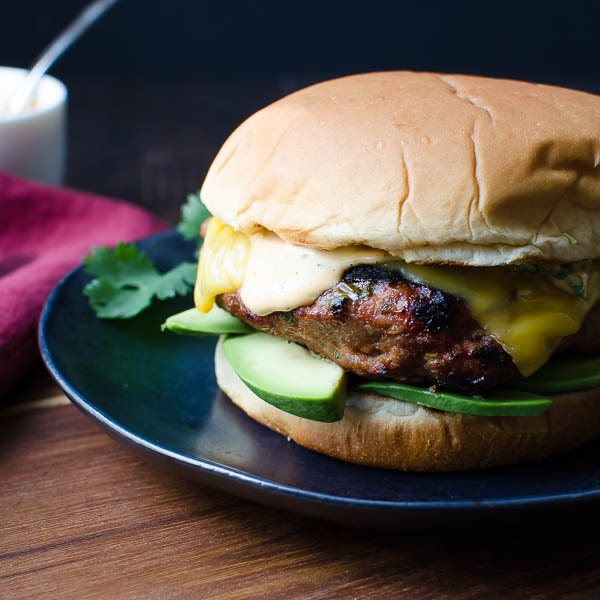 With a crispy exterior and soft, satisfying middle, these veggie burgers deliver flavor. 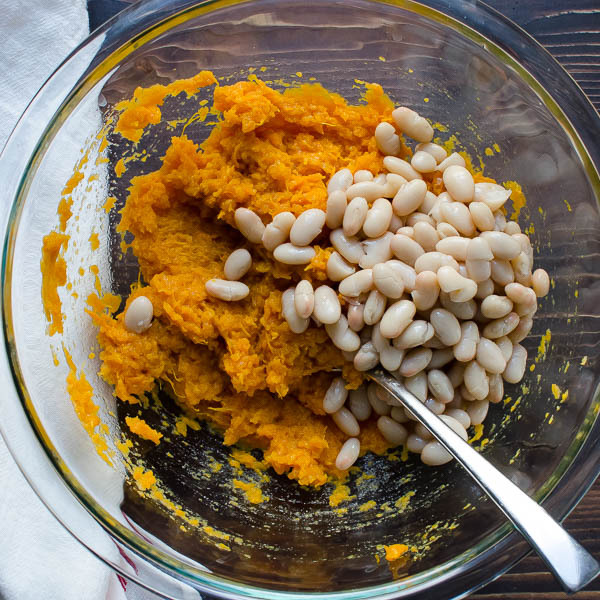 Preheat the oven to 400 degrees and bake the sweet potato for 30-40 minutes until cooked through and soft. 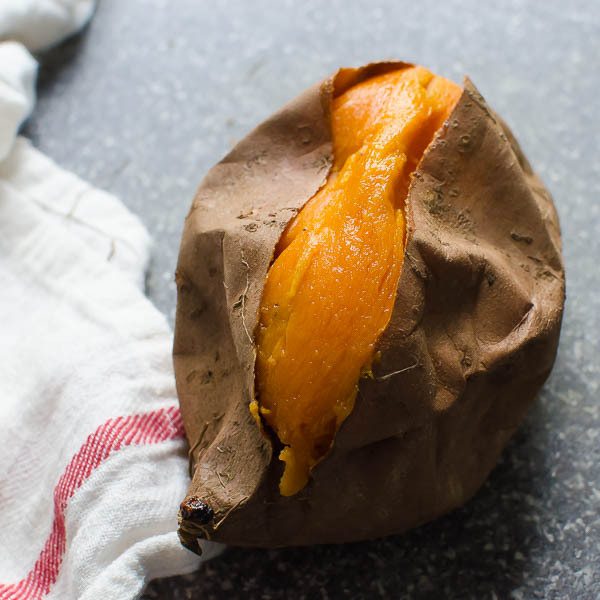 Remove the skin and transfer the potato flesh to a medium bowl. Mash the potato with the back of a fork. Add the beans and mash them into the potato mixture. Set aside. In a large skillet (preferably cast iron), heat one tablespoon of the oil over medium high heat. Add the chopped onion and saute for 1-2 minutes until slightly softened. Add the garlic and kale and cook for an additional 2-3 minutes until kale is wilted. Stir in the cumin, paprika, chipotle, cayenne, kosher salt and black pepper. 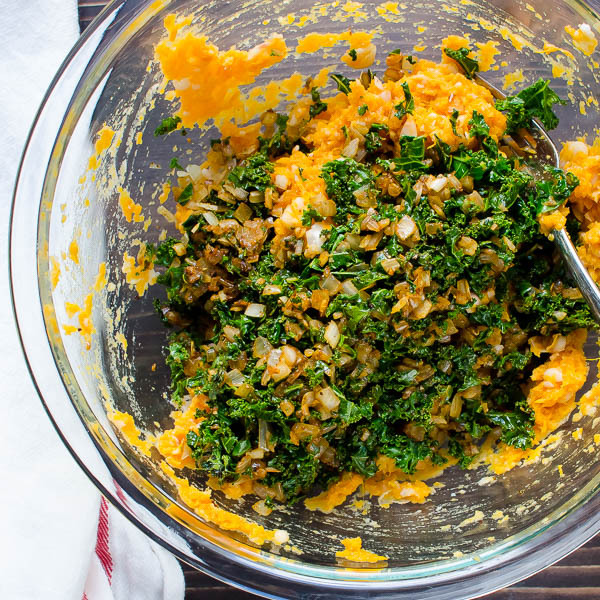 Transfer the kale mixture to the potato mixture. Add the rice and stir to combine. With your hands or a burger press, form the potato mix into patties. Refrigerate for half an hour to help firm them up a little. Meanwhile, add the cornmeal to a shallow dish. 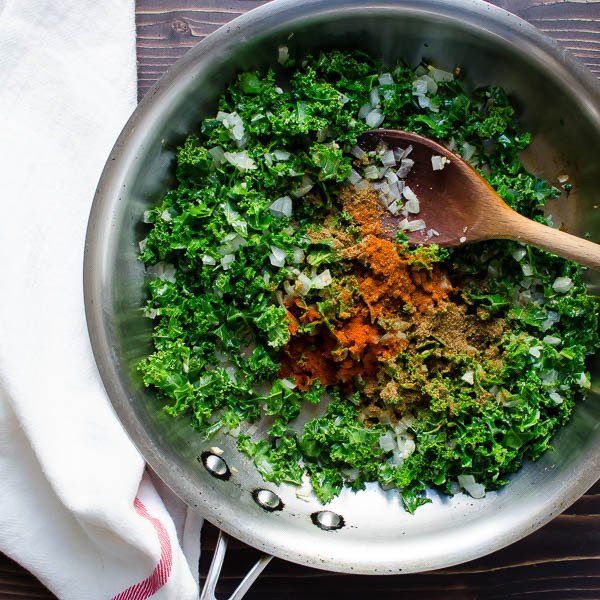 Add one tablespoon of oil to the cast iron skillet and heat over medium - medium high heat. Carefully coat the patties in the cornmeal mixture and add to the hot pan. Cook patties for 4-5 minutes per side until they are crispy and browned on the outside. 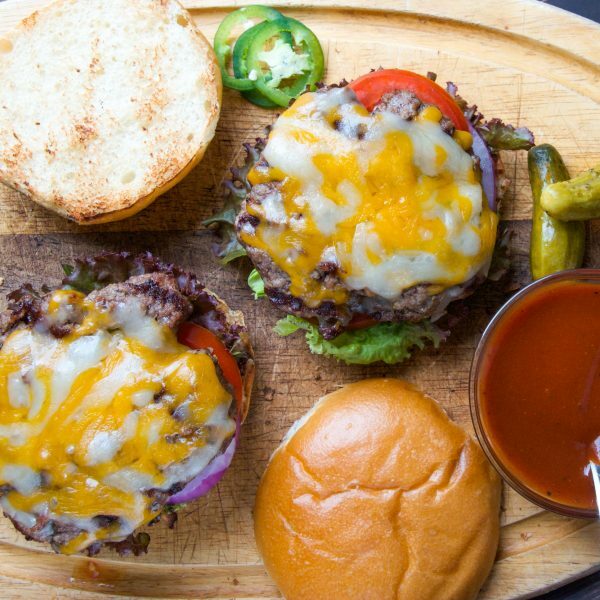 Carefully transfer the patties to a platter and assemble the burgers with your favorite condiments. These were the first veggie burgers I ever made or ate. They are amazing. I am going to try this recipe for meatballs tonight. Thanks for sharing! I’m so happy you enjoyed them, Lynn! These look fabulous! Great combo of flavors and the crust sounds just fabulous – way to get delicious crunchy crust! It’s great that you made this especially for your daughter, what a yummy meal! 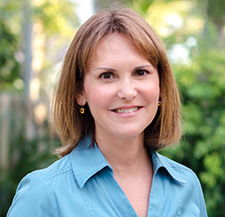 Thanks, Debra – my daughter provides inspiration for a lot of things we eat! LOL! This looks delicious! 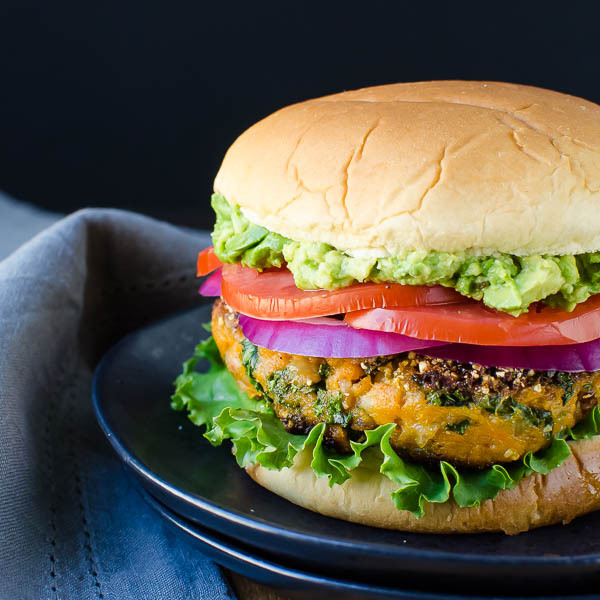 I love a good, creative veggie burger and this one definitely fits the bill! The corn meal crust is a great idea– I’ll bet it adds such a nice crunch to it! Thanks for sharing! I think a little crunch on the crust is a good compliment to a soft interior. I prefer veggie burgers over meat burgers any day! These look fabulous! What an interesting idea to add the cornmeal crust! These sound awesome and love that they’re loaded with so many veggies. 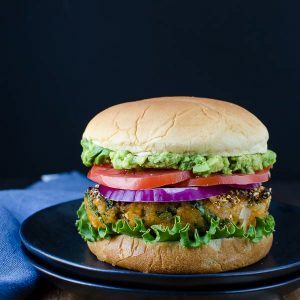 It’s a soft burger, the cornmeal adds a crunchy texture that my family likes! I have been experimenting with veggie burgers since the first of the year. I can’t wait to try your delectable appearing recipe! Glad you like the look of it! My daughter inhaled it! I’m so glad you like the blog and the veggie burgers! My daughter enjoyed this one! Really love the flavors you’ve used in these veggie burgers, Lisa. 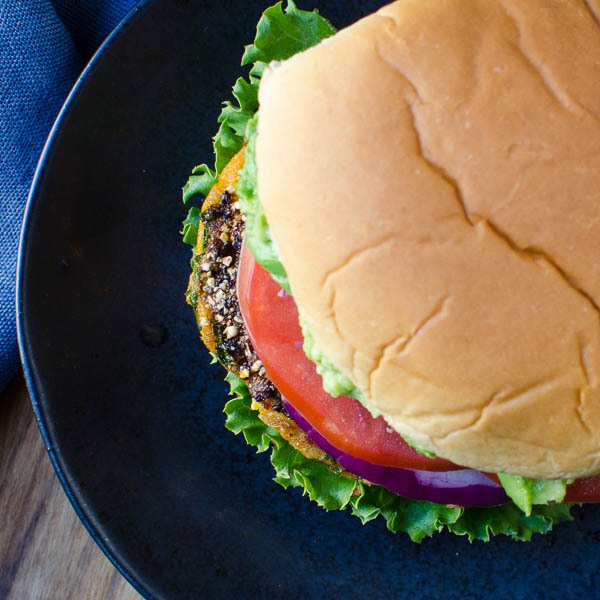 I’m a card-carrying carnivore, but meatless burgers can be so hearty and satisfying. It sounds like you’ve definitely made a memorable one here! The cornmeal crust must provide such a great contrast of textures. Will have to try these soon. I’m glad you’re digging it, Amanda! I eat anything – but my daughter wanted to try some veg-centric options. This passed! We’re definitely not anti-bacon in this house! Go for it! This sounds so tasty and unique! The burger looks hearty and delicious. I love the spices you put in there as well. Did it turn out really spicy? Not at all overly spicy, but if you can certainly moderate according to your tastes. One of the beautiful burger I have seen. Looks so delicious! O love it! So hearty and filling! Looks like a great alternative to a meat burger!! I bet it has tons of flavor! Vegan patties can be the hardiest to make so I can’t wait to try this one! Although I love a proper beef burger I also really love veggies burgers as there is just so much variation! These sound great with the cornmeal providing a bit of a crunch. 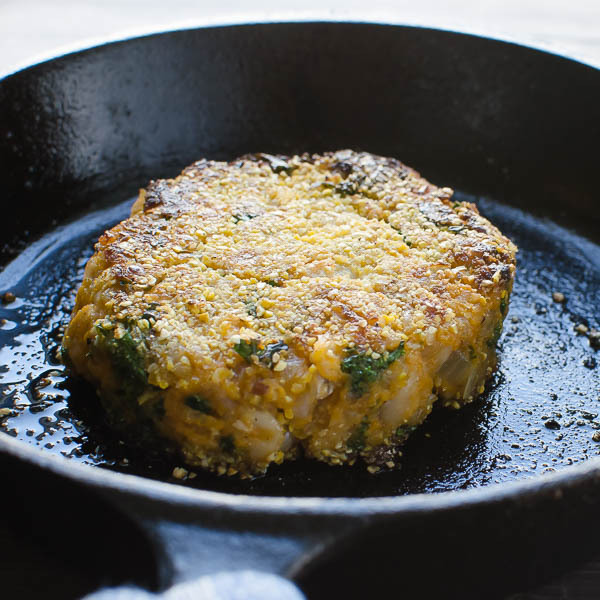 I really like a cornmeal crust – it’s rubbly and crunchy and I like it with a soft veggie pattie. I saw these on Instagram and about died! 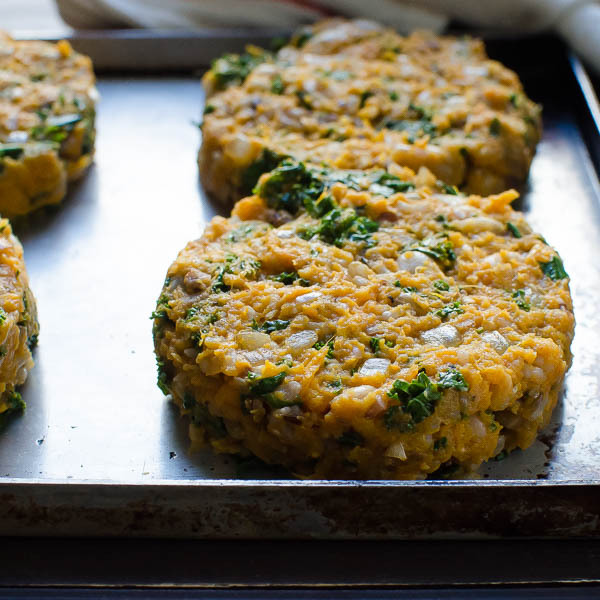 I need a good veggie burger and cannot wait to try these! Thank you so much for the recipe! don’t die! Let me know how you like them! Oh Lisa, gorgeous pictures as usual!!!! 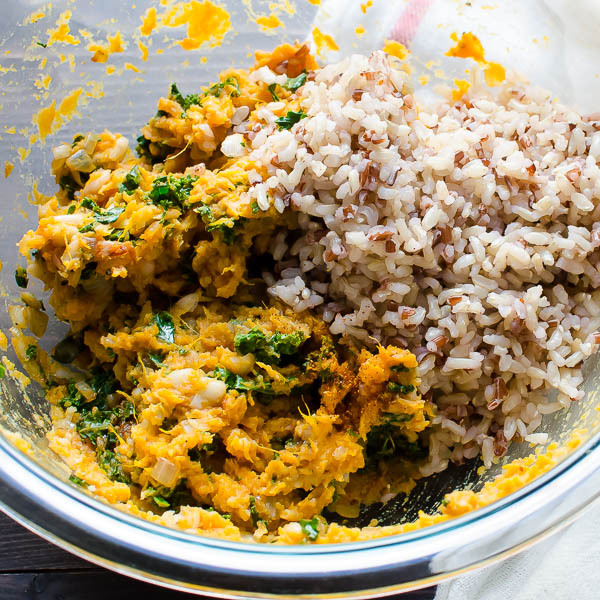 I can’t wait to try these – my vegetarian husband would love this one! Thanks so much, Tina – Let me know how your husband likes them! These veggie burgers sound awesome. I just made my first homemade one not to long ago also. 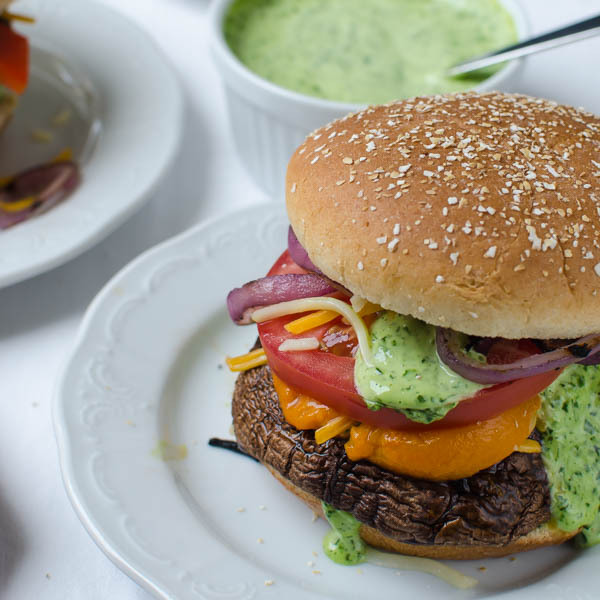 I do love a good portabella burger as well. I’m glad you think so! Enjoy! What a great idea to dunk the patties into cornmeal. I bet it really helps keep everything together and it looks like these are mighty delicious! All that yummy kale is in it too! YUM! They were tasty — my daughter and I ate them over several days — because they’re really filling with all the protein and fiber! 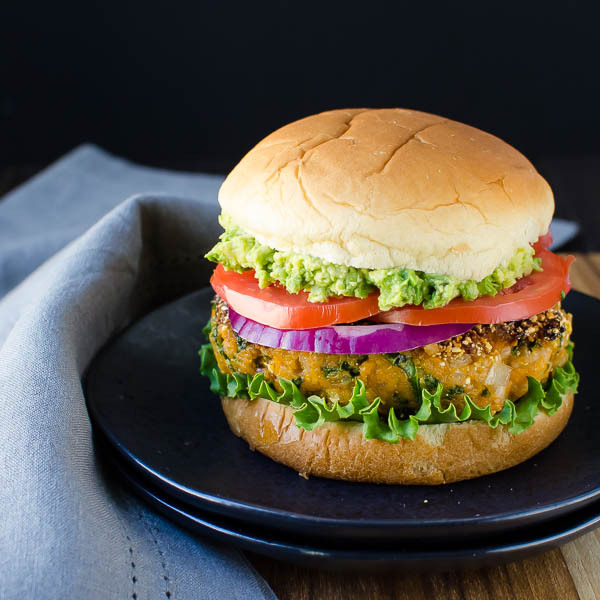 THIS vegetarian is in love with the looks of that veggie burger! wowzers!!!! Oh – thank you! I’m so glad you like it! 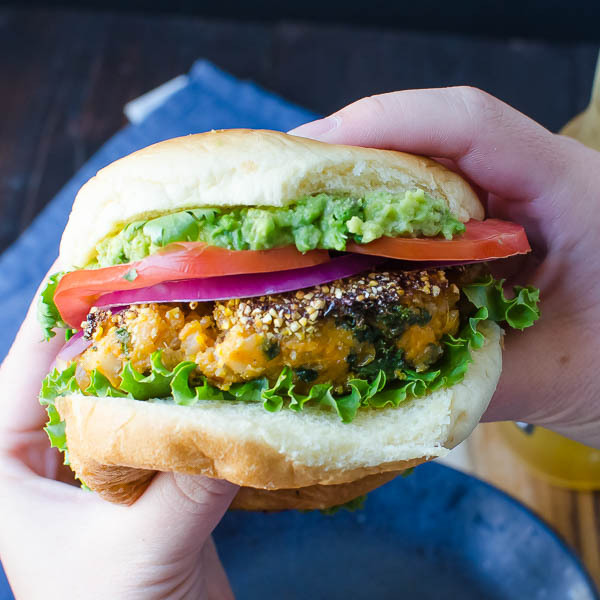 I am always looking for meatless burger recipes and this one with sweet potato sounds marvelous. I am definitely going to give this a shot!